Email Alerts - SOS4Net, Inc.
See below for current email alerts and notifications. For questions call 303-796-3000 or email techsupport@sos4net.com. SOS4Net IS NOT AFFILIATED in any way with any alleged tech support sites associated with the phone number 1-877-838-8777. If you have come to our site from an alleged support site that wants you to call that number, please be aware we are not at all associated with those sites. Apparently in May 2017 they discovered the information on our site and now are embedding a link to us in their sites, perhaps in an effort to lend credibility to themselves. Unfortunately we have no way to prevent this since we have no control over their websites. All that being said, the information we publish on our site is accurate and correct to the best of our knowledge, so feel free to use it as you please, and contact us at 303-796-3000 if you have questions about our services. It has come to our attention that some of our clients have received an email that, on the surface, appears to be from Wells Fargo Bank. It looks something like this. In fact we also received one of these. It looks VERY legitimate–until you hover your mouse over the Proceed To Update Here link. If you’re using an email client program, like MS Outlook, Thunderbird, or similar, hovering your mouse over the link should cause the link’s target URL to appear in the program’s status bar at the bottom left of the window. You’ll see that the domain name is NOT wellsfargo.com, which means the link is bogus. PLEASE DO NOT click this link. 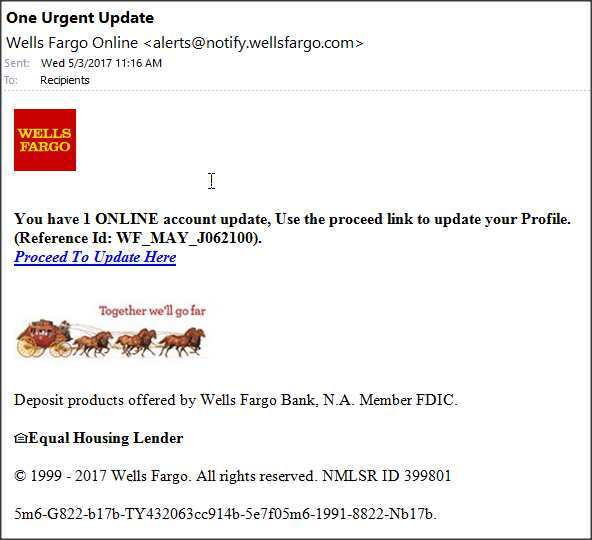 If you did click the link, and if you entered your wells fargo login credentials, CONTACT WELLS FARGO IMMEDIATELY by phone and take steps to protect your account.